Click here to go back to the Blessing after the Haftarah Reading. Click here to go forward to Ein K'Eloheinu. What Does the Aleinu Prayer Mean? We sing the Aleinu close to the end of every service. However, this was not always the case. The prayer originally was recited only on Rosh Hashanah and it was connected to the blowing of the shofar. 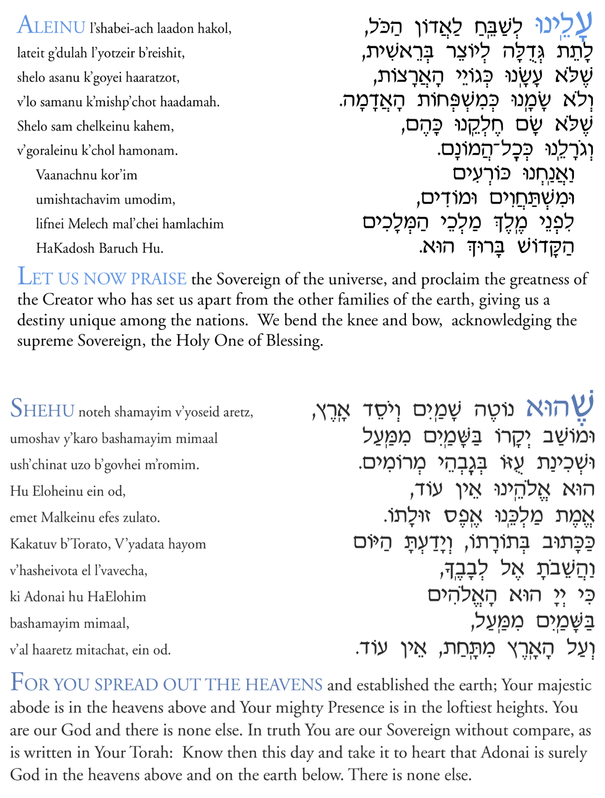 The Aleinu is part of the blessing recited before the first sounding of the shofar on Rosh Hashanah, the sounding in which we praise God as the ruler of the universe. In a traditionally observant community, when the prayer leader recites the Aleinu on Rosh Hashanah, he bows, gets on his knees, and places his head on the floor on the words "V'anachnu kor-im umishtachavim umodim lifnei Melech malchei hamlachim haKadosh Baruch Hu," "We bow, prostrate and give thanks before the Ruler of rulers of rulers – the Holy Blessed One." At Temple Sinai, the rabbi invites everyone to bow and prostrate during the prayer on Rosh Hashanah. However, the Aleinu is not just about God as our King. The prayer also expresses a vision of how God intends to rule the world. In the traditional words of the Aleinu, we state that God will "sweep away false gods from the earth" and "repair the world." 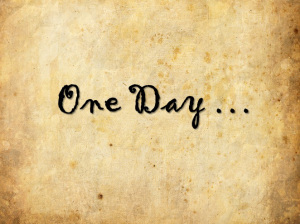 On that day, the prayer says, "God will be One and God's Name will be One." The Aleinu, in its essence, is a prayer about our hope for the world to be united and at peace, for evil to be driven from the world, and for all of humanity to be united in a common vision of God. This is why the Aleinu was so popular in medieval times and it is why it eventually was included at the end of every service. We need to express our hope that the world will be better than it is today. We need to say that, one day, all of humanity will all be united and at peace.